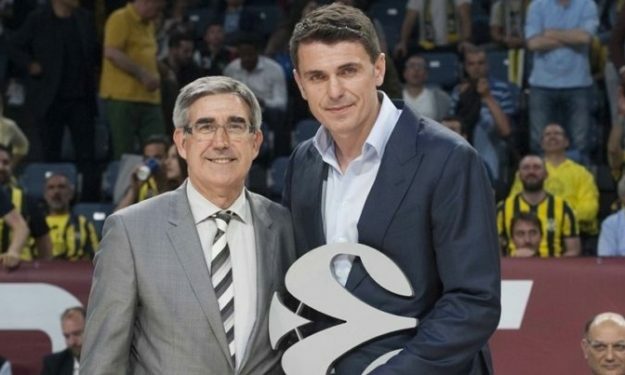 Αt halftime of the semifinal game between Fenerbahce Istanbul and Real Madrid on Friday night, he was named Euroleague Basketball Legend. Turkcan, age 40, finished his professional career in 2012 as the Turkish Airlines EuroLeague’s all-time top rebounder. Turkcan’s competitiveness, rebounding skills and all-around game quickly made him one of the first stars of the competition in the new millenium. He played the EuroLeague with Montepaschi Siena, CSKA Moscow, Ulker Istanbul and Fenerbahce Ulker Istanbul, as well as spending one ULEB Cup season with Dynamo Moscow. A power forward with a sixth sense to power the boards, Turkcan started his career with Efes Pilsen, helping it win three Turkish League and four Turkish Cup titles, as well as lifting the Korac Cup trophy – the first European crown claimed by any Turkish team in any sport – in 1996. He also played for New York and Milwaukee of the NBA and Paris Basket Racing of France before joining CSKA Moscow in the 2001-02 season. Turkcan had 13 double-doubles in 17 games, including a 27-point, 23-rebound effort against Buducnost, which makes him the first EuroLeague player who have a 20+20 game, an achievement that only two more players – Mirsad Turkcan and Spencer Nelson – managed to match. He earned regular season MVP honors. Turkcan played for Montepaschi Siena the following season, earning 2002-03 EuroLeague Top 16 MVP honors and qualifying his team to the Final Four for the first time ever. Turkcan would return to CSKA the following season, reaching the Final Four and winning the Russian League title in 2004. He also played for Dynamo in the ULEB Cup before joining Ulker. When the team became Fenerbahce Ulker Istanbul, Turkcan remained as one of its main leaders, helping it win five Turkish League titles and lifting two Turkish Cup trophies from 2005 to 2012. In addition, Turkcan was chosen to the All-EuroLeague first team in 2004, as well as being featured in the All-EuroLeague second team in 2002 and 2003. He is the EuroLeague’s all-time leaders in double-doubles, amassing 50 in 129 career games. He ranks second all-time in rebounds per game (10 rpg.) and third in boards per 40 minutes (14.1). Turkcan holds the all-time record for most rebounds in a non-overtime game, 23, and went over the 20-rebound mark four times in his career – twice as much as all other EuroLeague players combined. Fenerbahce decided to retire his #6 number soon after his retirement. Turkcan finished his career with 1,528 points, 1,287 rebounds and 142 steals in his EuroLeague career. Born in Novi Pazar, Serbia, Turkcan played for the Turkish national team, helping it get a silver medal at EuroBasket 2001. He led the EuroLeague in rebounding three times, finishing second or third another three.